Born in Oceanside, NY in 1973, Capt. Bill grew up fishing the waters of the Great South Bay on the south shore of Long Island, NY. There he spent his days fishing with his dad and grandfather in a small wooden Garvy they had built by hand. Targeting fluke, flounder, weakfish and mackerel… he was hooked! In 1987, he co-owned his first boat with his grandfather and for the next eight years logged countless hours as a commercial shell fisherman. Although the clams and profits were plentiful –the experience and “time on the water” would prove to be much more valuable. Like many others, it did not take him long to fall in love with Nantucket. The seemingly endless miles of beaches and surf was paradise. With the help of a local friend and commercial fisherman he caught more striped bass than ever before. In the summer of 1996 he was hired by local fly fishing legend and charter guide –the late Capt. Paul Doyle. By the spring of 97’ Bill had earned his captains license and began guiding clients to the rips, shoals, and flats off the west end of Nantucket. The diversity of fishing opportunities on Nantucket Island is tremendous. 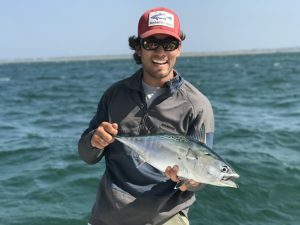 Whether you enjoy fly fishing for striped bass in the crystal clear waters of the Tuckernuck flats or casting a plug into the white water of Nantucket shoals, the conditions are never identical. Therefore, Capt. Bill feels that every fishing charter is unique and hopes to provide you with an experience to remember. Currently, in 2015, Capt. Bill Toelstedt enters his 20th season of full time guiding off Nantucket Island. Winner of the annual ‘Redbone/Nantucket Slam’ 5 of the past 6 years (2011, 2012, 2013, 2014&2015)… a lot of great memories have been created and Bill looks forward to what the future brings for Bill Fisher Outfitters. In the offseason he resides in New York City with his dog ‘Mako’ (yes, like the shark!) and is a proud member of the FDNY. 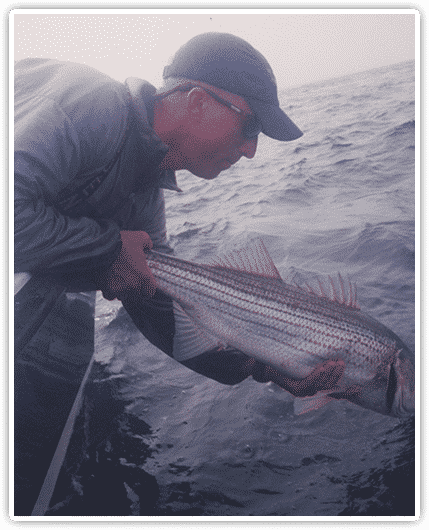 Corey has 20 years experience fishing Nantucket’s waters and has run boats for the last 14 years. He has spent time doing it all, fishing from the beach, tuna fishing offshore, stalking squaretails in the shallows and targeting striped bass in the Rips. Those who fish with Corey know that his summer home is on his 26′ Regulator. His days start early and end late, and he wouldn’t have it any other way. On top of guiding over 200 charters a summer, Corey is also the proud owner of Bill Fisher Tackle since 2005, and he is also the fishing Director for Great Harbor Yacht Club. While Corey is the first to tell you that he would rather be on the water than anywhere else, he enjoys teaching fishing at GHYC and gets his biggest thrill from hearing about others fishing success after seeking his advice in the shop. Those who have fished with Corey ALL speak about his ability to catch fish, whether it be inshore/offshore, Fly or Spin, but more importantly, people will talk about his passion and energy. This is perhaps Corey’s most impressive trait as he has an incredible ability to bring the best out of people in all situations. Those who fish with him can’t help absorbing some of his enthusiasm. Capt. 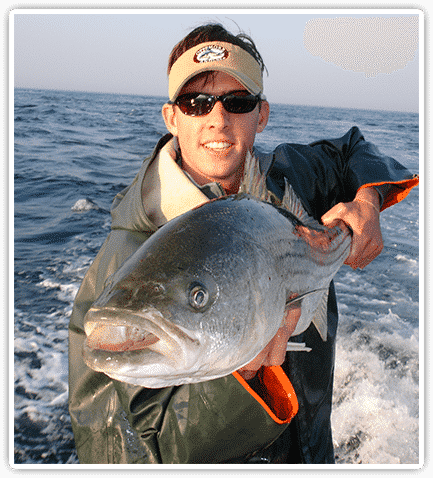 Cam comes to Bill Fisher Outfitters after nearly 15 years of charter fishing experience on and around Nantucket waters. Like many people, Capt. Cam grew up spending summers on the island with his family. That experience and his love of the outdoors quickly exploded into a passion for Nantucket and the diverse fishing opportunity this area offers. 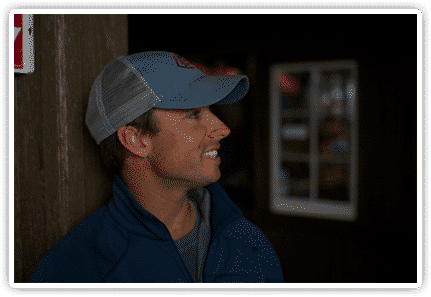 Over the years Cam has always had his hand in the fishing world and has worked for some of the finest fishing companies on Nantucket. He is also a partner in the great tradition of Bill Fisher Tackle. In his off time Capt. Cam is a principle owner of Fisher Real Estate. Bill Fisher Outfitters is extremely excited to have Cam on our team. He brings an amazing amount of enthusiasm and fishing knowledge as well as a proven history of fishing success to our charter outfit. Captain Chris began his career with BFO in 2013 and has quickly proven himself to be an outstanding fishing guide and asset to our company. Chris was born and raised on island by amazing parents. He graduated from Nantucket High School and went on to get a degree from MASS Maritime. Currently, he is a 3rd Mate Unlimited in the Merchant Marines, where he runs tanker ships in the Gulf of Mexico and various places around the globe. Chris is incredibly “fishy.” Although well versed at the inshore game, he has a special affinity for offshore fishing and the uncanny ability to raise tuna when they are being elusive. Capt. Chris has been guiding with BFO for the last five seasons. Those who fish with him seem to always request him again. He is an all-in type of guy. According to Chris, no day is fine or good…all days are great! We, here at Bill Fisher Outfitters, look forward to many more seasons with him at the helm.